When it comes to describing our future needs for archival storage, we sometimes use a motoring analogy. Back in the early days, a single lane in each direction was just fine for carrying the amount of traffic that existed. Then came dual carriageways but that still wasn’t enough. Now the motorways built to replace those earlier expansions are starting to become congested. And the demand for extra lane capacity is going to continue relentlessly. How do we build an archive superhighway for the zettabyte era? The digital universe is roughly doubling in size every two years, largely due to the explosive growth in connected devices and sensors. What’s interesting is that not only is this new digital world pushing the boundaries of compute, bandwidth and capacity, but it’s also re-locating how information is created and used. The ‘centre of gravity’ is moving from the data centre to an intelligent edge comprised of billions of end points. Gartner estimates that by 2020, there will be 20 billion nodes in the Internet of Things, propelling a market worth $11 trillion by 2025. Most data will become transient. It will be generated by mobile devices and shared or manipulated in the cloud while it is ‘active’. Then, as its usefulness and contemporaneity wanes, it will be dynamically classified and de-duped using Artificial Intelligence, passing through the storage stack until it comes to rest on a low cost storage platform. At this point, it will have been re-classified as archive data: low priority, infrequently accessed but still of potential, (possibly unqualified), value in the future. But what does ‘most data will become transient’ actually mean? According to IDC, although the digital universe is expected to reach 163 ZB by 2025, ‘only’ 7 ZB will actually be stored. And of that 7 ZB, ‘only’ 2.25 ZB will be best suited to a low cost, secure, long term storage technology like tape. In this instance, we keep using parenthesis around ‘only’ because 2.25 ZB is still 2.25 trillion terabytes of data! Without the areal density improvements projected for LTO Ultrium (96 TB tapes should be available by 2025), you would need ten times the number of cartridges currently being shipped to store so much archive or cold data. That’s what we mean when we talk about demand for extra lane capacity! Clearly, fast ingress and egress of data will remain critically important to avoid gridlock. Economically, tape is still the most TCO-effective option for the long term retention of infrequently accessed, but essential data. But it will also have clear advantages in terms of performance. An often overlooked feature of the HDD and tape roadmaps is that while the Information Storage Industry Consortium (INSIC) projects that HDD performance gains will slow down and may be as low as 5% CAGR by 2025, LTO tape data rate growth will be IRO 20-25% in the same timeframe. This makes tape better suited for retrieving huge quantities of unstructured data for transfer to a faster platform, like high performance disk or flash, for analysis. Simply put, to transfer very large amounts of data to or from a state of suspended animation, tape will not only be cheaper but faster than other alternatives that we currently know about. And that innate advantage may be intensified thanks to a system of deploying tape that is now being deployed in some intensive high performance installations such as the US Oak Ridge National Computing Laboratory. Although these are not yet mainstream, in the future, the amount of data and throughput being discussed will filter down into midrange applications, just as surely as Formula One technology eventually finds its way into the mass-automobile market. This advanced tape system is called RAIT, Redundant Array of Independent Tape. RAIT improves the throughput of large sequential files by creating multiple parallel data streams into the tape subsystem and, as with RAID, it can also provide various degrees of fault tolerance for higher availability. RAIT levels are implemented through software, depending on the number of tape drives in the array configuration; how critical drive recovery is in the event of a fault; and how vital it is to maximize tape throughput. The data transfer rate is limited to the slowest drive in the stripe although ideally all RAIT drives will be of the same generation - e.g. all LTO-6, all LTO-7. 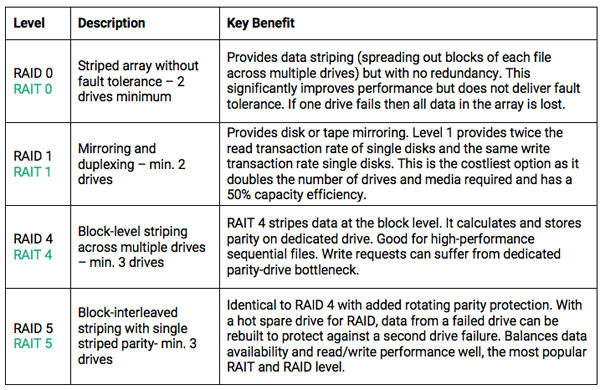 As with RAID, RAIT can offer data redundancy without needing to create multiple copies. Striping and parity are the keys to RAID and RAIT implementations. 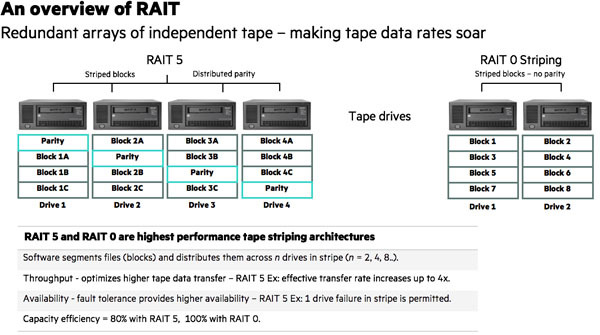 With RAIT data striping, data is distributed over multiple tape devices, so that the data blocks are processed in parallel and sent to tapes in multiple drives simultaneously. This dramatically increases throughput. Meanwhile, all of these physical striped drives are virtualised so as to appear as a single drive. A RAIT stripe can extend to up to 16 drives depending on the software used, just like sixteen lanes of vehicles on a physical highway. As with conventional RAID, parity provides striped RAIT systems with fault-tolerance capability for higher availability. Depending on priorities, throughput versus fault tolerance, RAIT can be used with or without parity. Arguably, RAIT 5 is the most efficient and effective option because it increases potential transfer rates by a factor of up to 4X (in the example shown below), while still providing greater fault tolerance - up to one drive failure in four is permissible without data being lost. Meanwhile, users should only expect to see a 20% loss in capacity efficiency by using RAIT 5 over RAIT 0. In summary, although RAIT is still the preserve of HPC and hyperscale environments, the colossal growth of data we are set to witness means smaller enterprises and mid-sized companies will soon be grappling with the same challenges of how to archive petabytes and even extabytes of archive data. INSIC predict that tape drive data rates are likely to be five times faster than HDDs by 2025, which makes a RAIT-based tape system a very attractive efficient and cost effective option for archival operations. RAIT has the potential to provide an archive superhighway for multiple lanes of high speed data.